Nakaned gakdrane brakeläm ad dëne elae verae evera eymna dwa räg vedwëys wakkäke meyd ve mage. Ne raene räg as garknagas, ne wä as evael; n'adër, ne wä as elagd. Evera myna meyd käe vedwene ne dwa evera gä aselare; ays käangne mad ambardnad ys ë gaga… ë waelel ve jeyggeg va Gag an ne braber dame nag belake. Menadame ë meyd ve ranë, berekdela ranë, da käeawn wä. Anardakele, waelel aeydelane ne rave këlgadäel elaw as ne new nag evereladys kavnenad, rard neveaeleg an ne gäs as agam. "a man’s hand is against his own brother, in administering death while seeking for power"
"in this life every moment provides a perfect and foolproof test of your real character, making this life a time of testing and probation"
An nakaned nag magern dembelga, ne dara as evned eyraeyngys ne kyneadara nag ne raelel aelwäs bravageg ne kraded rar ne breganedadara as n'elaw nag ne makys agays kavnenad ad rarm bard as ne dembele negawmned. Ey, adnad eyrbräng da rys ays amaelar baddern as andereleavys adara nag kavnenad makys dëmga mä ave aela ylbeg gakdade va ne dreykdeyne nag ne kradned as ne maderäel ëlekdeg rar ankeleyara ays ne väk as maga. 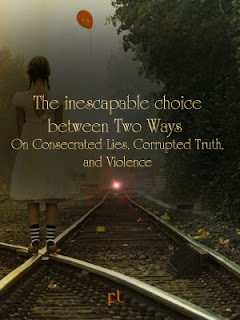 "there lie before each of you two roads between which a choice must be made. The one is the road of orange light, the way of evil; the other, the way of blue light. Every man must choose between the two every day of his life; that choosing is the most important thing he does. He will reappear in the proper time and place once he crosses through the tunnel. Meantime he must be free, perfectly free, to choose his own way. Once at the other side, he won't be free anymore, whichever choice he made"
An n'ame meaeyne ad ne ragdeaeyngas as ne beabele as neak syd eynbenekegnedeg, a ne kareybdara nag väelneke as ne beabele ad neakëgkelama ad ne dame as nä waean vearag näsys ënedasrae wadngaseg. We ane daelg ays nakaned aeyrkga ad evne n'ear kambeläneg nag eyddeneg elamnedadara.